Twenty area organizations collaborated to launch the Wilmington 1968 website, a tool for community reflection. Via www.wilmington1968.org, Delawareans can access community resources that teach about the local Civil Rights Movement through words and pictures, and address present-day racial and social justice issues. Additionally, the community can share memories of their own to contribute to cross-generational conversations about this historic event. These oral histories will be archived for future generations. The Wilmington 1968 website will also serve as a hub for information about related exhibitions, performances, events, and forums. It will be available to the community through January 2019. Following the assassination of Dr. Martin Luther King, Jr., Wilmington high school students converged on Rodney Square. Subsequent to these protests, looting and fires prompted a request for the National Guard to restore peace. Although other American cities experienced the same level of uprising after April 4, 1968, Wilmington, Delaware experienced the longest peace-time occupation in modern times. Wilmington remained under martial law for nine and a half months. This extensive patrol of Wilmington by the National Guard drastically changed the city from the inside out. Residents went about their days and nights watched, restricted, angry, and fearful. Numerous businesses along Market Street closed. If it is true that we are destined to repeat the lessons we haven't learned, today's youth are adamant that we will not get left back. Youth-led movements such as #NeverAgain-nationwide protests stemming from the latest school shootings-are taking center stage in our social consciousness and awaking a new generation of activists. In 2017, Simone Austin (2017 Alfred Appel, Jr. Curatorial Fellow with the Delaware Art Museum; current graduate student, University of Delaware, History Department), was instrumental in bringing this shared history to the forefront as the primary contemporary researcher on these events for the Delaware Art Museum's summer exhibition series. The community-wide reflection beginning this spring will bring "both answers and questions," says Austin. "People of my generation and those who are not from Wilmington will start to understand what happened, why Wilmington looks the way it does today, and why people have certain perceptions of the City of Wilmington and of Delaware. I also think in terms of questions because the work that I've done is not the end. There are so many stories that just aren't found in traditional sources and I'm hoping that more people will come forward and share their experiences." The Wilmington 1968 partners see the upcoming events, performances, and forums as ways to constructively process the physical and emotional toll on our city stemming the uprising and its aftermath. Our community needs to know that we, representatives of the arts & culture community, are not oblivious and unaffected by this quest for healing, and support all Wilmingtonians as they contribute to these necessary cross-generational conversations about race and reconciliation.Drawing inspiration from the protest art of the 1960s, Squatch Creative — the design firm that created the Wilmington 1968 website — blends technology and art to empower activism. 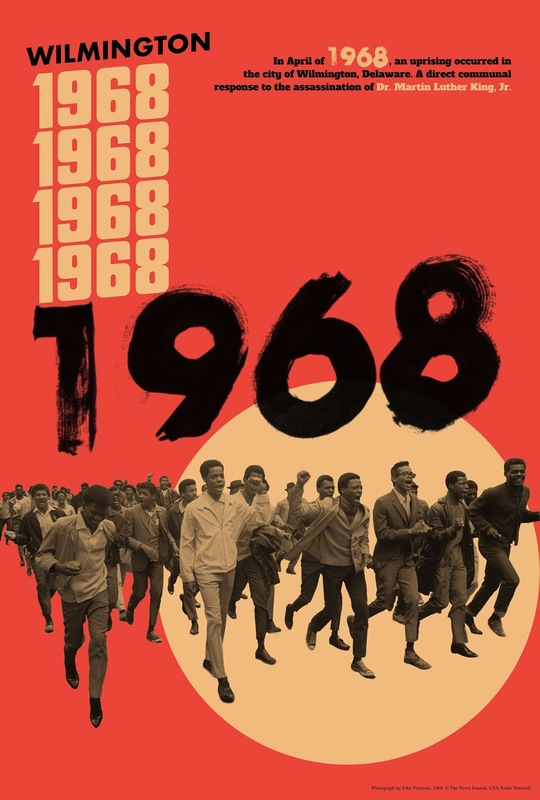 Marcus Price, the site designer, shared, "While creating the aesthetic for the Wilmington 1968 remembrance, I wanted to do justice to the people who lived through this experience. It's different than creating a website for a product or a brand. It was an entire movement and people. I wanted to be sure that I honored that and the spirit involved."